Preheat the oven to 350 degrees. Grease a 9 x 9-inch brownie pan and line it with a sheet of parchment, leaving some extra parchment on either side; this will help with removing the brownies. In a glass or stainless steel bowl, nestled in a saucepan with simmering water, add the butter and chocolate chips. When melted, about 5 minutes, stir until very smooth. To the bowl of a stand-up mixer, add the eggs, white granulated sugar and brown sugar; beat using the paddle attachment until it turns a pale brown color, about 5 minutes. Add the melted chocolate and mix. Stir in the salt and peppermint extract. Fold in the flour and mix just until combined. Lastly, stir in the white chocolate chips. Pour the batter into the prepared brownie pan and transfer to the oven to bake for 25 to 30 minutes, until the tops is crackling and the edges pull away from the pan. Allow to cool completely in the pan; run a knife along the edges and lift up the excess parchment. 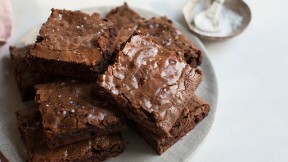 Cut the brownies into squares and garnish with a bit of sea salt.